COLORADO SPRINGS, Colo. — The U.S. Olympic Committee this week announced that USA Triathlon is the recipient of the USOC’s annual Advancing Diversity & Inclusion Award, which recognizes the National Governing Body with the highest annual growth percentage of underrepresented individuals based on diversity data for women and racial and ethnic minorities. USA Triathlon led all NGBs and High Performance Management Organizations in the Olympic and Paralympic movements with a 6.23 percent increase in membership for women and persons of color from 2015-16. Percentage increases were evaluated based on overall NGB numbers, which includes board members, employees, NGB membership, and national team athletes and coaches. The USOC will present the award on Friday night as part of the U.S. Olympic Assembly held this week in Colorado Springs. The award comes with a $5,000 grant from the USOC, which USA Triathlon will use to further support programs that focus on making triathlon accessible to all, regardless of gender, ethnicity, race or socioeconomic status. In coordination with USA Triathlon, the USA Triathlon Foundation offers annual grants to support diversity-focused grassroots programs across the country, including for youth, women, paratriathletes and more. In 2017, a total of $86,000 in grant funding was distributed to 25 organizations that transform lives by opening pathways to triathlon for all — particularly those who may not have found it possible otherwise. 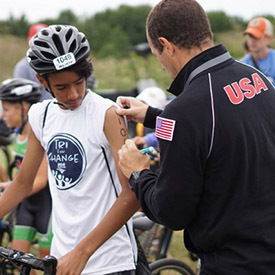 USA Triathlon’s Tri for Change program, launched in 2014, provides a unique opportunity for underserved youth ages 7-15 to train for a triathlon with a dedicated coach. The program culminates in a premier race experience at the USA Triathlon Youth & Junior National Championships, held annually in West Chester, Ohio, through 2021. As part of the program, children receive personal instruction and mentoring from a USA Triathlon-certified coach, as well as financial support for travel, a training plan, race entry and a USA Triathlon annual membership. This June, USA Triathlon launched its WIN Initiative, a series of 18 low-cost and community-driven events across the country designed to drive participation by women new to multisport. The inaugural events are a combination of newly created women’s-only triathlons and duathlons, women’s-only waves within existing races, instructional clinics and social gatherings. The volunteer-driven USA Triathlon Women’s Committee also promotes women’s participation and leadership in multisport. The Women’s Committee primarily focuses on professional mentoring and identifying opportunities for women in positions of authority and decision-making within the associations that govern the sport. USA Triathlon works to promote diversity in triathlon at the international level by partnering with the African Triathlon Union and the American Triathlon Federation (CAMTRI) on outreach initiatives. These partnerships include donations of clothing, apparel, shoes and triathlon gear to underserved communities, as well as opportunities for international athletes to attend triathlon training camps at the U.S. Olympic Training Center in Colorado Springs. For more information about the USOC’s Advancing D&I Award and to view the full listing of award winners for the 2017 U.S. Olympic Assembly, visit teamusa.org.